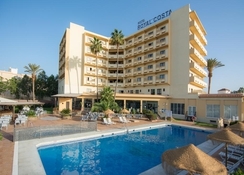 Royal Costa is a family-friendly hotel that offers relaxation and comfort to its guests, steps from Torremolinos’ main beach. The rooms in the hotel are available in plenty of categories including Family, Double or Twin, and Junior Suites to ensure the needs of all guests are met – plus the private balconies available offer mountain or sea views. There is a splash-tastic swimming pool available surrounded by tropical gardens, plus a Buffet Restaurant, Lounge Bar and Swimming Pool Bar to indulge in. The buffet restaurant offers both international and Mediterranean delicacies on the other hand the pool bar is the perfect place to be for soaking up the sun while sipping refreshing drinks. Want to explore the surroundings? 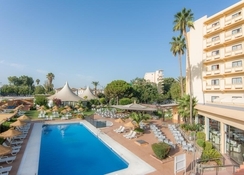 The town centre of Torremolinos is less than a mile from Royal Costa, plus the nearby train station will take you to the neighbouring resort of Malaga. 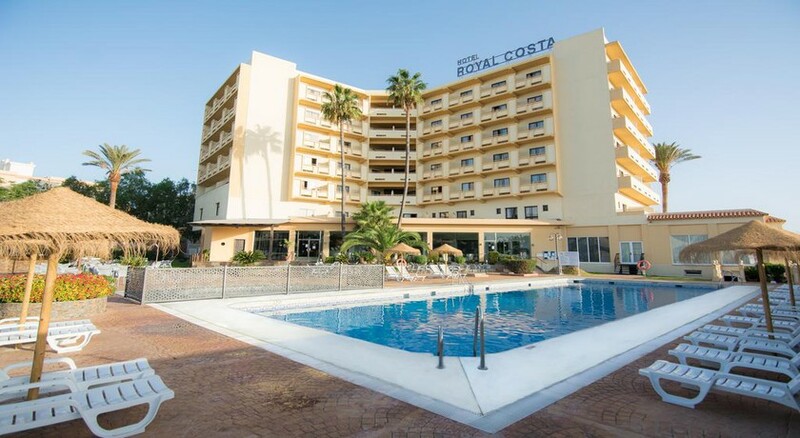 Royal Costa is ideally situated in the heart of Torremolinos, a popular tourist resort in Málaga, Spain. there are numerous shopping malls, restaurants and bars near the hotel that will make it convenient for the guests to stay entertained. The Malaga Airport is the nearest airport, only 7.6km away. The bedrooms in the hotel are filled with necessary and luxury amenities that will make you feel like you’re staying in a home-away-from-home. 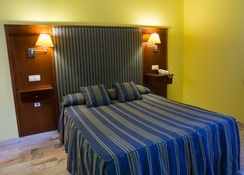 They are categorised as Double Room, Family Room and Junior Suite. Some of the facilities in the rooms include air-conditioning, telephone, flat screen TV, heating, private bathroom, terrace/ balcony, satellite channels, safe, hairdryer, toiletries and wake up service / alarm clock. The food and drink facilities in Royal Costa are available in numerous varieties-thanks to the expert chefs that have expertise in preparing Italian, Mexican and Asian delicacies. The buffet restaurant serves delicious breakfast, lunch and dinner in Mediterranean as well as international style. The Lounge Bar is open throughout the day and night, it is an ideal place to have snacks, coffee and cocktail. Sports, leisure and entertainment facilities in the hotel are available in abundance. Some of the sports and entertainment facilities for adults and children include bicycle rental, heater, air conditioner, children’s play area, mini club, table tennis, children’s pool, swimming pool, billiards, mini club and many more. Take advantage of the hotel’s car rental service to explore the region at your own pace. The Hotel won’t accept bookings for stag or hen parties in Royal Al Andalus Hotel & Royal Costa Hotel or for bookings groups in All Inclusive of a range group os ages that could suposse a problem for the establishment. In case of detect any booking as this type prior to arrival, we will inform you in order to contact to the customers for the cancelation of their booking. In case of we can’t detect it prior to arrival and the customers show in the hotel, we will reject the stay in the hotel and we will charge the 100% fee of all the rooms like compensation of the cancelation. We had a great stay here. Always found something to eat everyday pool was brill for my wee boy who is a strong swimmer as pool is very deep! Rooms dated but very close to everywhere. Airport basically across the road just a €2 return to other towns. Would love to come back just update the rooms a little!! Great most of the staff spoke English (don't get transfers Los Alamos station is a short walk from the hotel and the airport has a station a 10 min.journey) Just pick a bottle of wine from the counter at mealtime (A.I.) nobody counts.Talk about 5 a day at one meal I had 25 including fruit and red wine The train ticket machines are easy press bottom left hand corner and it's all in English.There are no mats for the sunbeds I just bought an air bed in the shop up the hill the main road is up there and a good bus service not far to walk on the way back look out for the pedestrian fly over. We went mid April good value. Upon arrival at the hotel we found it to be clean and the staff were nice,friendly and helpful Rooms were fine..a wee bit dated but comfy all the same and with regular maid service . You can't book a 3 star hotel and expect 5star service.